A Christian cross pendant with ornate scroll-work behind the cross, representing the beauty and glory of God in .925 sterling silver. Cross pendant measures 44mm x 42mm in size (1 3/4" tall x 0.86" wide). "The heavens declare the glory of God; and the firmament sheweth his handywork" (Psalm 19:1). You can delcare God's glory too by proudly displaying a symbol of your faith that can also act as a conversation started to preach the Gospel and declare the heavenly kingdom. Add a box chain to make it a necklace (optional). Includes free shipping and a 45-day return policy. 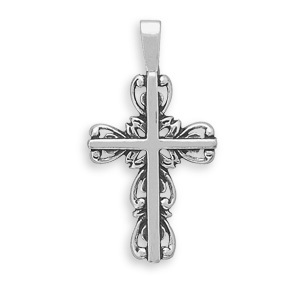 We guarantee our Christian Cross with Scroll Outline, Sterling Silver to be high quality, authentic jewelry, as described above.